This popular liquor dispensing setup is gaining ground for bars and restaurants that mix up their own mixed drinks in bulk. 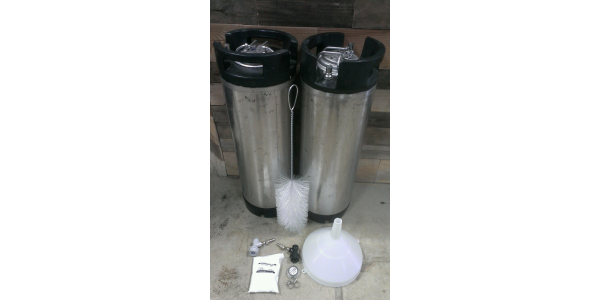 It comes with two stainless steel 5 gallon kegs so you can be ready to roll on a busy night. This 3 gallon Liquor Dispensing System (LDS), comes with brand new 3 gallon kegs, and will be delivered with a small about of pressure in them. You will need to relieve the pressure by pulling the pressure relief valve (ring or tab) in the center of the removable lid. This will allow the co2 in the keg to vent out. To remove the lid, after relieving the pressure, push the lid into the keg, rotate the lid so it will fit through the opening and pull it out. You can now fill your keg, using the funnel and screen provided, if necessary. 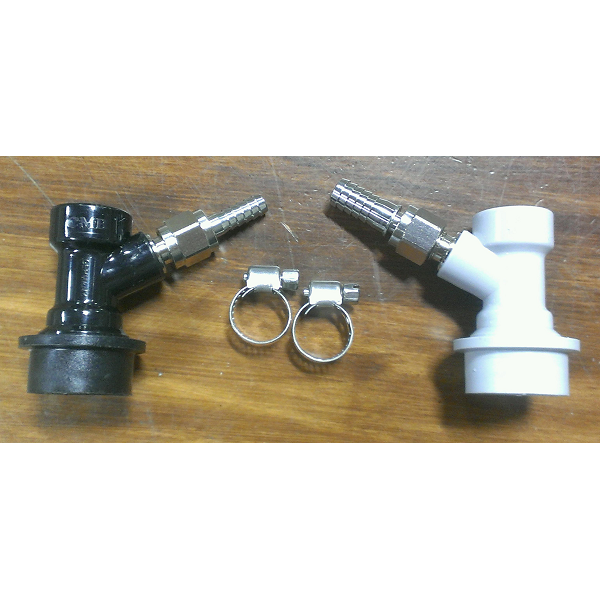 You will need to attach the BLACK quick disconnect to your beverage tubing that connects to your faucet or dispensing gun. We have provided a stainless steel hose clamp for you to secure the tubing to the barb on the quick disconnect. You will need a flat head screw driver to tighten the hose clamp. You can now attach the BLACK quick disconnect to the beverage - OUT post on the keg. It is clearly labeled on the side of the keg. The label says "BLACK IS BEVERAGE". Slide the ball lock quick disconnect onto the post until it clicks in place. Likewise, you will need to attach the GRAY quick disconnect to your GAS source or your CO2 supply tubing. We've provided a stainless steel hose clamp to secure the tubing to the barb on the quick disconnect. You will need a flat head screw driver to tighten the hose clamp. You can now attach the GRAY quick disconnect to the GAS - IN post on the keg. It is clearly labeled on the side of the keg. The label says "GRAY THIS SIDE - GRAY IS GAS (CO2)". Slide the ball lock quick disconnect onto the post until it clicks in place. We have replaced and lubricated all the O-Rings in the system, and provide a small tin container of food grade lubricant or "Keg Lube" for you to apply to the O-Rings whenever needed, or after cleaning. This will ensure the quick disconnects are easy to slide on and off, and will extend the life of the O-Rings. In addition, a small layer of keg lube applied to the O-Rings will help ensure a leak free seal. You can now pressurize your keg and dispense your tasty beverage. To clean your keg, DO NOT use Clorox (Bleach) solution. Bleach can pit stainless steel as it reacts with the bi-metals in stainless. 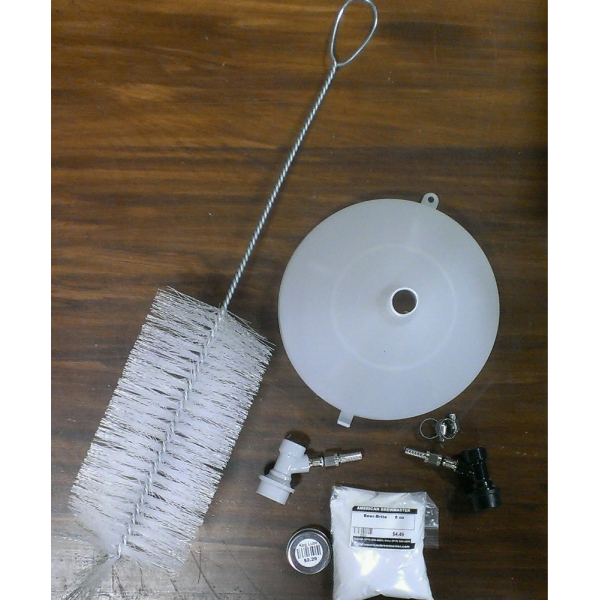 Your kit comes with a package of commercial grade brewery cleaner / sanitizer that is easy to use, easy to rinse, is environmentally sound and is safe for septic systems. Mix a tablespoon of this powder per gallon of water and let soak for several minutes. 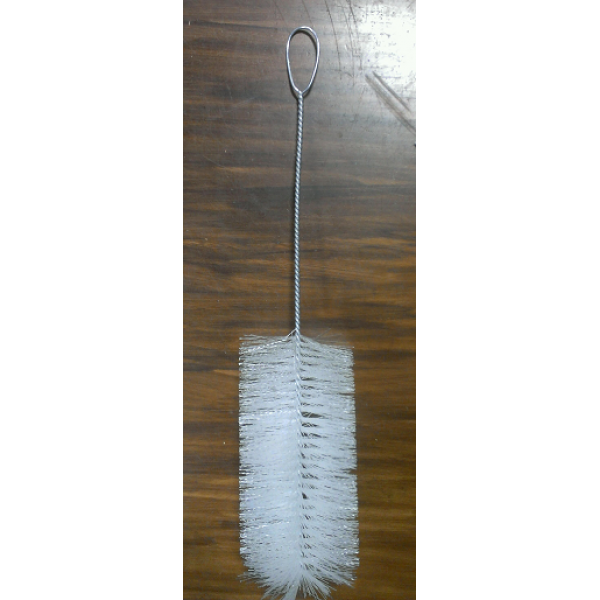 You can use the provided brush to brush the inside of the keg, if necessary. Soaking the inside of the keg with this solution is usually sufficient to clean and sanitize the keg. Pressurize the keg and push the cleaning solution out the dispensing faucet to clean the tubing and faucet or gun. Fill the keg with water to rinse it out, and push the water through the tap, also. You are ready to go again! We fill CO2 tanks, and are conveniently located just off Capital Blvd at 3021-5 Stony Brook Dr, approximately one mile north of the 440 Beltline. 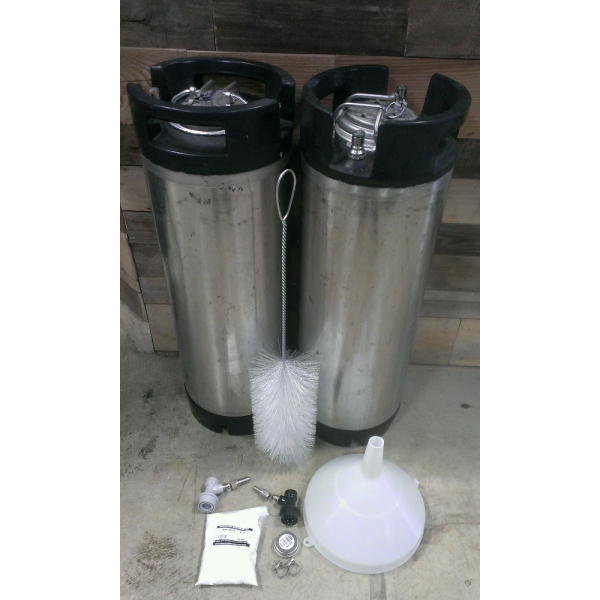 Stainless Steel Draft Tower with faucet.Includes 5' of 3/16" commercial grade beverage tubing and co..
Dip Tube O Ring slides over the gas or liquid dip tubes in a Cornelius style keg. ..
Lid (Keg) O-Ring for Soda Keg..
Plug O Ring, Post O-ring for ball lock keg posts. Fits Liquid or Gas price per O Ring.. 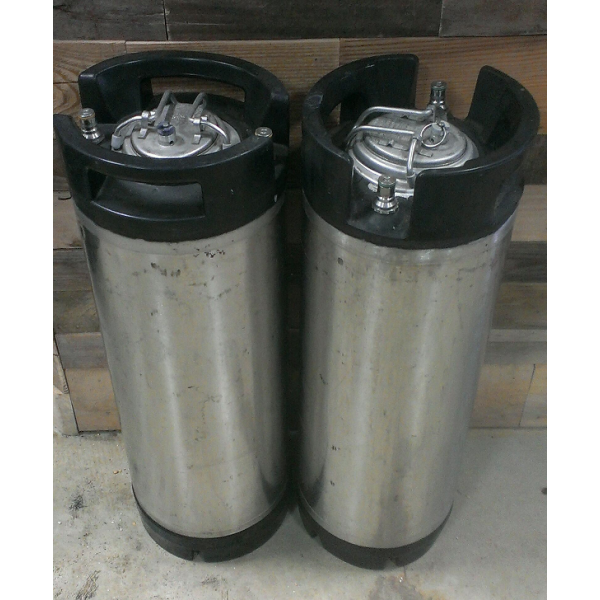 These used Cornelius kegs are in great shape. They will show some wear and tear, as they are used. T..
Clamp on stainles steel Tower Drain for Portable Bar used to dispense from a temporary or portable l..
Infuse fruits, hops, herbs and spices into your beer, soda or mixed drinks with this handy keg infus.. This set up is designed for the LDS system and included a set (one each) of the black, liquid quick ..